Product prices and availability are accurate as of 2019-04-25 04:25:05 UTC and are subject to change. Any price and availability information displayed on http://www.amazon.com/ at the time of purchase will apply to the purchase of this product. ... smoking all over the place. ... dripping on your precious wooden dining table. ... all burnt in like 10 minutes. Then it's about time you invested in a MontoPack tealight candle set. The only candle 100 pack that combines elegance, durability, easiness and affordability. Is Valentine's day knocking at your door? Show off your love with our white candles and a bottle of wine! PROTECT YOUR FURNITURE: Find peace of mind with these dripless tealight candles. Forget about stains on your favorite coffee tables. Forget about the cleaning nightmare. Forget all of the above with MontoPack wax candles. The sleek aluminum tin holders keep the unscented candles burning without ever damaging your beautiful furniture. 1 CANDLE PACK - ENDLESS USES: Explore the versatile nature of our white tea lights candles today and complement your home like never before! Great for personal and professional use, home décor, wedding receptions, Christmas holidays, Valentine's day, anniversaries, pool parties, garden fun, summer balcony nights, DIY crafts and more. LONG LASTING BURNING WICKS: Made of high quality paraffin pressed wax, our tea light candles ensure long lasting burning performances for up to 4 continuous hours. More hours equals more moments with beloved ones. Enjoy clean, smokeless and flicker-free flames. Surprise your family and guests when they come over next. EACH DELUXE TEA LIGHT CANDLE PACK INCLUDES: 125 white tealight candles. Our tealight candles have 100% cotton wicks that enhance the burning process. They are compact yet generous in size. Each candle measures 1.5'' diameter and 0.65'' height. CREATE A COZY & WELCOMING ATMOSPHERE: Upgrade your home décor without spending a small fortune on pricey decorators or fancy candles. 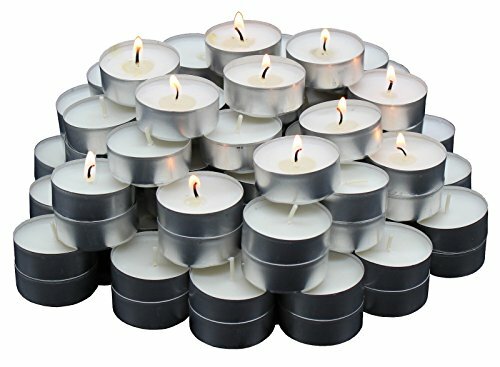 Order your MontoPack tea light candles 125 bulk today and add an aesthetically pleasing touch to any area in the house. Great for indoors, outdoors, bedroom, bathroom, guest rooms, patio, traveling and more.